Shrdlu our Office Cat has been having to work in the shop for a few days due to the illness of an employee who is now back on the job, much to the relief of Shrdlu. Spring and early Valley summer are definitely here, despite little cold flares, and Shrdlu, like the editor, has spring fever and is sort of happy to find someone else to do a task for him. EDITOR’S NOTE: Shrdlu our Office Cat is a feature that ran weekly in the mid 1948 – 1949 editions of La Feria News. The feature ran in a one column section entitled “The Corner” which was used as a forum for small editorials and filler stories. The feature usually consisted of a small illustration with a humorous story. Throughout the year we’ll be running the Shrdlu cartoons, as well as other vintage cartoons from our archives, as space allows. We’re trying to discern the identity of the cartoonist that produced the Shrdlu feature, but haven’t been able to find very much information online. At present our best guess is that it was a throwaway filler by cartoonist Nathan Collier. According to Lambiek Comiclopedia: Collier was born in Orangeville, Illinois. He studied at the Acme School of Drawing and at the Lockwood Art School. 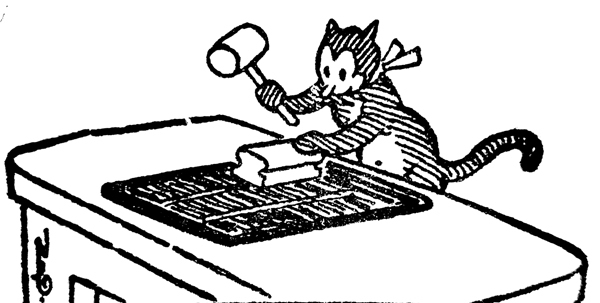 He did cartoons for the Chicago Journal, as well as the feature ‘Our Own Movies’ (1920). His panel ‘Little Journeys to Yesterday’ alternated with ‘Wouldn’t It Make You Mad’. He did the comic strip ‘Kelly Kids’ around 1923 and cartoons for Life and Judge. In the 1930s, he made the panel ‘Can It Be Done?’ and the comic strip ‘The Professor’. If any readers have any information on the identity of this cartoonist, please email us at news@laferianews.net. This cartoon ran in the April 7, 1949 issue of La Feria News.